You’ve probably seen the anti-smoking ads that show a man exhaling through a hole in his windpipe. Not pretty, eh? 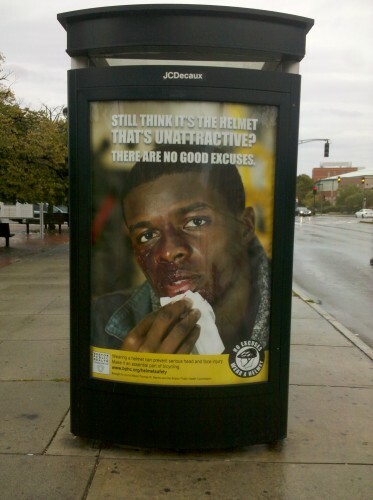 Well, the Boston Public Health Commission seems to have borrowed a page from that campaign in a new appeal to cyclists regarding helmet use. Check out the ad they’re using to promote protective headwear: a closeup of man with a serious case of road rash on his face. This is some seriously violent imagery for a public safety campaign. The idea being that you make not wearing a helmet socially unacceptable by appealing to the fear people have of getting injured. Anti-smoking campaigns work in a similar way, appealing to people’s fear of mortality in order to get them to make different choices. However there are some important differences. Smoking is an addiction, addictions require stronger pushes to get people to fight them. Cycling is GOOD FOR YOU! Showing bloody images of people on posters is not going to encourage people to cycle. More cyclists seem to equal safer cyclists. Several studies have shown that increasing the number of cyclists on the road will actually make them safer. Most fatal crashes involve vehicles and cyclists. Helmets are good, but driver/cyclist education, better engineered roads, and enforcement will go a lot further in preventing these crashes than helmet usage will. So adding it all up, these bloody ad campaigns might actually do more harm than they avoid. Elsewhere on the Network today: Steve Patterson at Urban Review STL says six months without a car has made him think differently about time, but it hasn’t made him less productive. Streets.mn praises a new initiative called “Investment Ready Places” that identifies small cities and towns in position to support mixed-use, walkable growth. And Greater Greater Washington explains why the safety benefits of automated traffic enforcement outweigh drivers’ irritation at having to follow the law. It's not a coincidence that bicycling remains dangerous in our helmet-obsessed safety culture.